Samsung wants to make an even bigger splash in the US market to cement their position as the top cellphone provider Stateside, rolling out a couple of handsets in the form of the Samsung Sunburst and the Samsung Strive. The former will be a full touchscreen display that is accompanied by a wide range of customizable widgets, while the Samsung Strive is a stylish vertical slider that has a full QWERTY keyboard. Expect to see both devices hit the market via AT&T online as well as in brick-and-mortar stores from March 21st onwards. More details on both handsets will be revealed right after the jump. The Samsung Sunburst comes with a 3.0” full touchscreen display to keep you connected to family and friends in style. It boasts a sleek, futuristic black and chrome design, where the Sunburst’s resistive touchscreen relies on widgets to provide users with one-touch access to their favorite features, applications and social networking sites including Facebook and MySpace. Apart from that, you get advanced messaging features including text and instant messaging and Mobile E-mail, offering you with options to stay connected at all times. Also, you will find the following key features – a virtual full keyboard for easy typing, a full browser experience with Single Zoom, Smart Unlock for easy access to applications, a 2-megapixel camera with camcorder capability, SMS and MMS messaging, Mobile E-mail, support for AT&T SocialNet, AT&T Mobile Music and AT&T Navigator and Bluetooth connectivity. As for the Samsung Strive, this vertical slider will feature the styling cues of the Samsung Propel range of messaging devices, where you will be able to choose from a couple of color options – black/silver and purple/charcoal. The inclusion of a full, slide-out QWERTY keyboard makes it a snap to send text messages as well as e-mail in a flurry, while you can also access group messaging with conversations, taking advantage of threaded text messages with video, pictures and the ability to view multiple conversations simultaneously. The Strive is the first device of its kind from AT&T which will offer a trio of new mobile services – a new group messaging service, AT&T Mobile Share and AT&T Address Book. 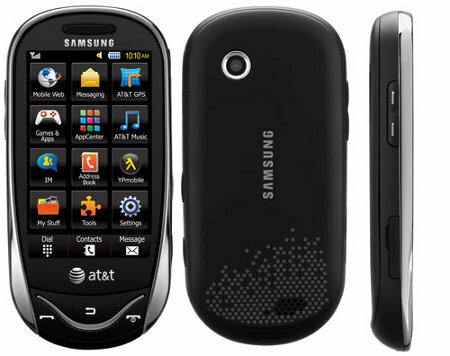 The Samsung Sunburst is pretty cheap at $39.99 with a two-year agreement and mail-in-rebate, while the Samsung Strive is even cheaper at $19.99 for a limited time, since it falls under AT&T’s current 50%-off quick messaging phones promotion. Any takers?